There are two motherboard versions. Rev. D has all simm sockets grouped together, Rev. F has them arranged in two groups. CPU : 80C386DX-25 MHz. Keyboard Switchable Ctrl-Alt-1 = 8 MHz, Ctrl-Alt-2 = 25 MHz. Use number keys on numeric pad. Battery : DS 1287 soldered on motherboard. 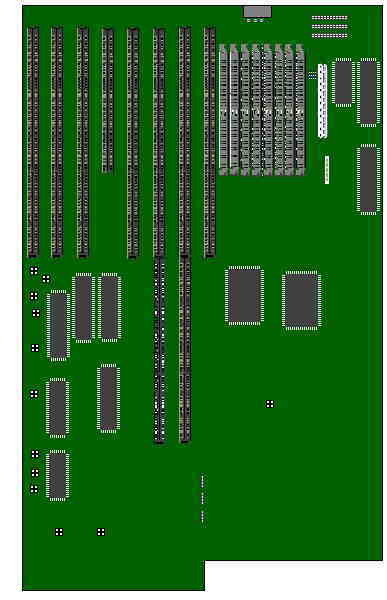 Maths Co-Processor : This system supports the 80387SX-25 math co-processor. It is installed at location U41. No jumper settings are required. RAM : 4MB standard Maximum on Motherboard 8 MB. This board will accept RAS/CAS, Fast-Paged, or Static Column memory upto 8MB. SIMM type, either 256k or 1MB SIMMS, at a speed of 100ns. See the jumpers section for necessary jumper changes when upgrading memory.